One week late, but here’s episode 17 where I cover the iconic first person shooter series from id software, DOOM. There’s so much to say here that I don’t spend much in the way of time on news, I only mention that Chris Roberts’ Star Citizen project has concluded its funding campaign successfully. They are still collecting for stretch goals so check it out! I then read a quick email and jump right into things with the main topic, id software’s DOOM series. I cover the story (such as it is), gameplay, get reasonably deep into the design of the game engine and look at the very interesting development story. Next week, we cover a very interesting game series: Alone in the Dark. Hope to see you then! I was soooooo looking forward to this one, and you didn’t disappoint! 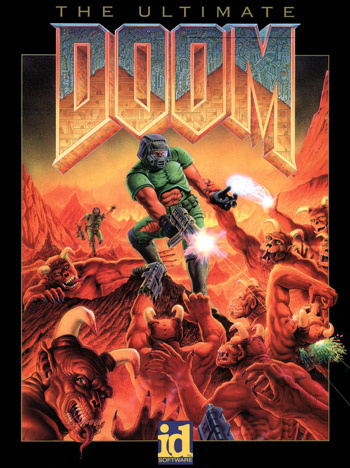 Doom 2: Hell on Earth must be the first FPS I ever played. I have very fond memories of playing the game. I never had the courage to go very far in the singleplayer game (I was too much of a chicken, that’s a credit to the brilliant sound design, I hadn’t even *seen* a monster and I was already scared!). But I played a lot of deathmatch with my father and sister (we had two computers in the house, the old and the newer one, hooked up to one another). I was lots of fun. I too blew myself up with the RPG once or twice (perhaps more). I also remember a Jurassic Park themed map with a sound track Samuel Jackson saying “hold on to your butts!” every time you fired the BFG. Good times! !